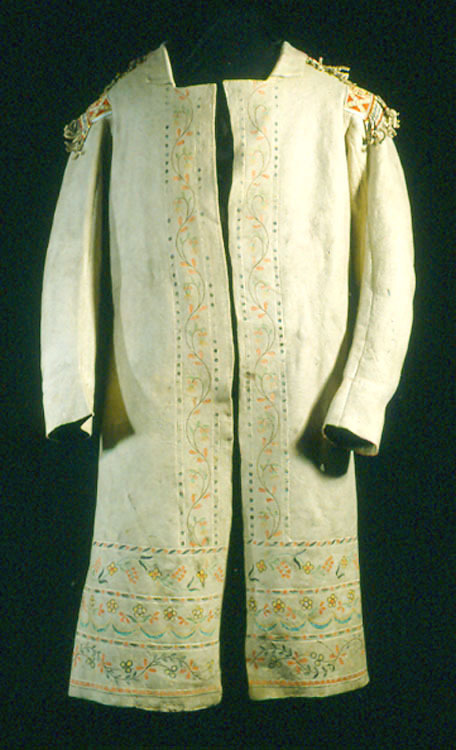 Early 19th Century hide coat from the Red River Settlement area constructed in the style of a European "frock coat." This garment is probably made from bison hide. It is decorated with floral paintwork and flattened and dyed porcupine quills in the shoulder areas. The quilled panels were woven on a bow loom before they were attached to the coat. A woven sash, perhaps an Assomption sash or ceinture flêchée, would have been used to keep the coat closed. Learn more about the Metis - enter 'Metis' in the search box to your left. Check the Beaver Index - e.g., type in 'Metis,' 'clothing,' 'crafts,' etc. Visit the Virtual Museum of Métis Culture and History. While several Aboriginal groups produced a similar style of garment, Metis women from the Red River area were particularly renowned for their production of this type of coat. It reflects a blending of the Aboriginal and European worlds that were brought together through the fur trade. Unlike the plain European woolen cloth versions, these coats are richly decorated with a combination of colourful First Nations geometric designs and Metis floral work. In addition to being worn by the Metis men, these coats, along with decorated pad saddles made of animal hide, were traded for European goods.